We can discuss your options, assess the area and make expert recommendations. Our family business has origins dating back to 1975. Our sun protection systems reflect the latest in technology and design. We specialise in providing tailored systems that are suitable for your environment. 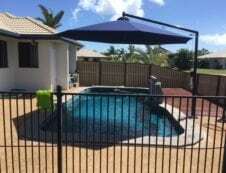 Shadeland is an industry-leading, family business, specialising in the design and installation of high-quality blinds, awnings, umbrellas, cyclone shutters and shade sails in Townsville, the surrounding areas of Ayr, Bowen, Mackay and Mount Isa, and beyond. From our headquarters in Hyde Park, we travel far and wide to complete projects, from the north of Queensland all the way to Rockhampton and out to the Whitsundays and the Northern Territory border. For over 40 years, our family business has led the way in providing the latest sun protection systems, combining the best in engineering technology and design. We have two generations of our family that are dedicated to offering the finest in shade, privacy and weather protection that money can buy. Our extensive range can be uniquely custom-designed and is regularly sought out by home owners, businesses, schools, councils, builders and architects. We group our products into four main product lines. Between them, they represent a total solution of external shade products for homes, businesses and public buildings. These popular systems are the perfect choice when a large area needs protection from the sun. These strong fabric shade systems offer up to 95% protection from the sun’s harmful UV rays. They come in a wide variety of designs and colours, and offer one of the most versatile solutions in large area protection. 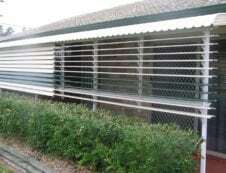 We offer a wide variety of Cyclone Shutters, Aluminium Shutters, Privacy Screens, Aluminium Louvres and Aluminium Slats and Polycarbonate Awnings. These products are extremely durable and come in a large range of styles and colours to match and complement any home or business architectural design. With warranties of up to ten years, these products offer some of the highest levels of protection from the sun, wind and weather. Our extensive range of awnings and blinds features both fabric and aluminium options and styles. Whether you need fixed awnings or mechanically retractable and pivoting shade systems, our range of products will be able to meet your needs. We offer awnings for both homes and café’s or restaurants. We also offer both interior and exterior blinds in a wide range of styles and colours to fit every décor. One of the products that we have seen growing in popularity is our range of outdoor umbrellas. They offer a colourful, tropical aesthetic to every home garden or outdoor business seating area. They are as rugged and versatile as they are trendy and they offer flexibility around pools, decks, gardens and patios. 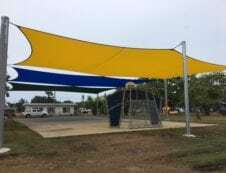 To discover the most comprehensive range of high-quality shade systems in North Queensland, make Shadeland your first destination. Talk to our engineers to find out what the best options are for your particular application. We will make it easy for you to arrive at the best solution for you. We have internal timber shutters, PVC and aluminium shutters. Frequently used as fence panels, patio screens, sun filters, window screens and security and also as features. 100% aluminium powder-coated to a colour of choice. 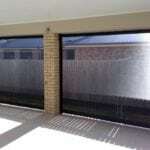 A smart modern solution for privacy and sun control. What benefits do they give? How strong are they really? Shadeland Shutters are the strongest fully-tested shutter on the market. How are they attached to the ground? They can be either bolted down or an in-ground footing can be used. Our entire range is 100% aluminium and powder-coated in a colour of your choice, offering a maintenance-free structure. We use 100% acrylic or vinyl, which offers 99% sunblock and UV protection. Are they only centre post? 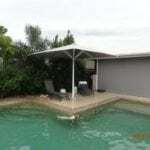 No, we also have side-post umbrellas which allow you to cantilever over pools, decks etc. What winds can the umbrellas withstand? Our umbrellas can be tailor made to any size, to suit any requirements. 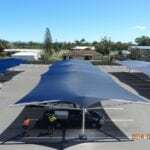 Do you have remote control Awnings? 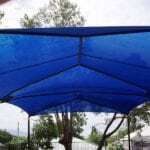 What fabric awnings to you sell? Aluminium is one of the most durable materials due to its high resistance to corrosion and weathering, requiring minimum maintenance. What types of aluminium awnings do you have? How can I stop the sun and heat coming through my windows….. onto my patio? 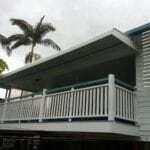 With our huge variety of Awnings designed for any windows, patios, decks, balconies and outdoor areas. How do you design a shadesail? Shadeland has its own in-house design team to work WITH you to create a design which best suits your needs and enhances your property. How big do my posts have to be? What do you use to attach to structures? We have several varieties of ways to attach securely, whether to a wall, a roof, a fascia board or to beams. What do you use to attach the shadecloth to a post? Shadeland has one of the biggest, if not THE biggest, range of fabrics and colours for you to choose from. Why no cable in shadecloth? Because steel cable is a heat conductor and over a short period of time can cause drying of fabric, thereby shortening the lifespan considerable. Do you use wire in your edges? YES in vinyl we do, our vinyl shades have Stainless Steel cabling to the perimeter edge and Stainless Steel tensioning plates for the corners. What type of cloths do you use? Waterproof is a Ferrari Vinyl. Which comes in many grades to suit your requirements from domestic, right through to commercial and industrial. What wind speeds can they withstand? 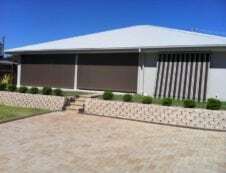 All our shades are engineered to Australian and Local Council standards. FREE measure, design and quote. There is a 10 year warranty on cloth and a 3 year warranty on workmanship. Yes, we do and we can also work with insurance companies. Do you supply button-operated blinds? Yes, we specialise in both manually operated and button-operated retractable blinds – we have styles available using both electricity and solar power. Can your products withstand storms? 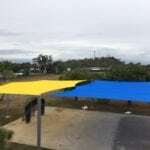 How do I know if I need an umbrella, shade sail or awning? Do you work with builders and architects? It is nice to deal with a local family business. Boys did an excellent job, it looks great. Just letting you know that the boys did a wonderful job, you guys should be proud of them.